Gorgon Stare is a multi-camera wide-area airborne surveillance sensor that will allow the US military to film a four-kilometer radius underneath a Reaper drone. 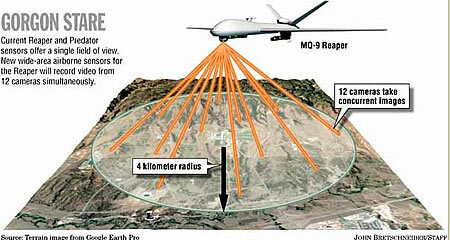 Gorgon Stare will allow a combat controller on the ground, a commander at headquarters and an intelligence officer back in the U.S. all to choose a different angle from the same Reaper, said Maj. William Bower, deputy program manager for the MQ-9 Reaper. Gorgon Stare is a surveillance system that looks at an entire city at once. At some point, its input will probably serve DARPA's Mind's Eye, which will add visual intelligence to the mix. There are more than ninety different CCTV architectures currently on sale in the UK, many of which are imported and cannot be fitted with FPGAs suitable for running the SCORPION STARE basilisk neural network prior to installation. Data Disclosure Orders served under the terms of the Regulation of Investigatory Powers Act (2001) serve to gain access to camera firmware, but in many regions upgrades to Level 1 MAGINOT BLUE STARS compliance is behind schedule due to noncompliance by local police forces with what are seen as unreasonable Home Office requests. Unless we can achieve a 340 percent compliance improvement by 2004, we will fail to achieve the target saturation prior to September 2007, when CASE NIGHTMARE GREEN is due. See also Air Force Times, Wired and The Concrete Jungle.